French Poilus advance along side a Renault FT-17 only to be cut down by withering machine gun fire. 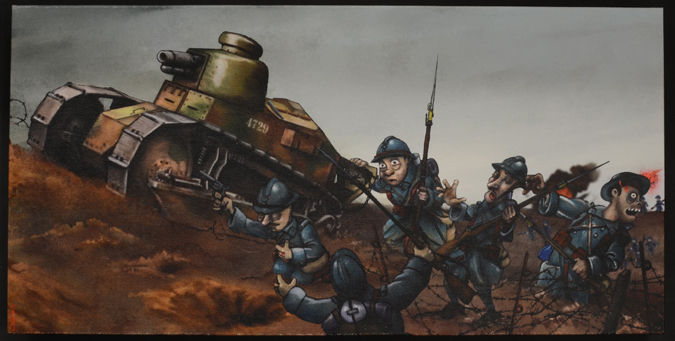 By first time in Europe are available the works from the famous American illustrator Doug Dearth, originally hand drawn and colored with acrylic paints and watercolors, scanned and retouched by self artist. This digital painting comes printed on a 20" x 10" x 1-1/4" canvas ready to hang with all the hardware and a sturdy black paperboard backer. The canvas, ink, and coatings are formulated to work together to provide the highest quality, longest lasting product available and have been UV tested to ensure that color will stand the test of time.